But you’re struggling to maintain readers attention and engagement on your blog? It’s getting harder for your readers, there are a lot of distractions out there. 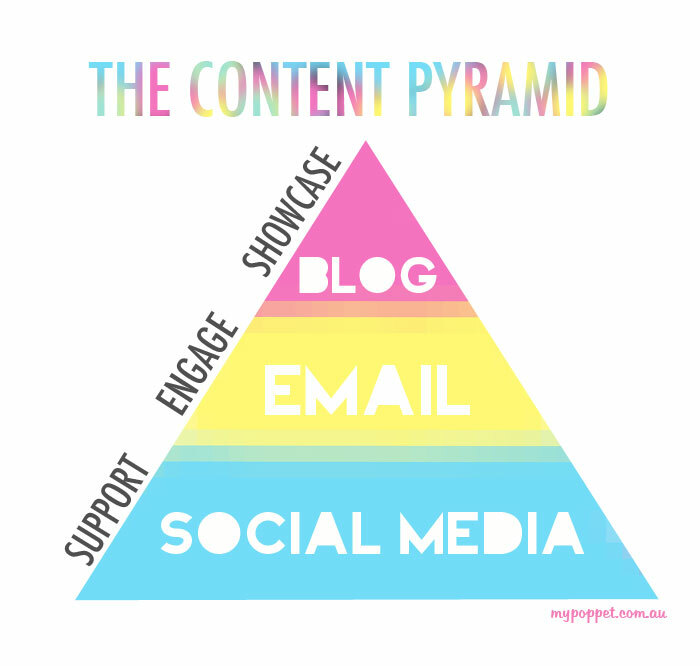 It’s time to start thinking about a hierarchy for the content you create. It contains your well crafted, original content with good images (that hopefully are yours too). This content has taken you the longest to create, the most thought and effort has gone in. Entertain your readers, solve their problems, don’t be crap! It should show case the best of what you have to offer as a blogger. This great content is what can potentially lead to earning an income for you if you decide that’s for you. These are people that have committed to receiving content from you on an ongoing basis. Make an effort to communicate and engage with them by giving them original content that may not quite make the blog, but is still good. Talk about something relevant and topical, direct them to quality blog content on the blog. Supporting it all you have social media platforms like facebook, Instagram, twitter, pinterest. Just because this is at the bottom doesn’t mean it’s less important. This content may take less time to create but it all should work towards reenforcing the brand of your blog. Followers on social media platforms should like what you do there so much they want to visit your blog to get more of, not the same, but better content. Don’t make the mistake of sharing the exact same content over all platforms equally. The content you create or share at the bottom should all work to drive traffic to your blog where you deliver your primo, best of the best stuff. For those who want to monetize, think of your blog as prime real-estate. Sponsored messages on your blog should be more expensive than campaigns on platforms lower down the pyramid. The time invested to create a post and the quality of the content should reflect this accordingly. Don’t repost all your Instagram pictures for the week as a blog post. If your followers have already seen them on Instagram, why would they visit your blog for the exact same content. You wouldn’t repost a whole weeks worth of tweets as a blog post would you? Instead, choose one good image and add some more information/content to give it new relevancy. If you chose to feed your facebook posts to twitter, try to make them under 140 characters so your message doesn’t get cut short. Be prepared to respond to comments on various social media platforms. Obviously everyones blog is different, so you need to try out what works best for you. Think about what information you would like to communicate with your readers and choose a platform that works best with that content. Do you really need to be blogging? Will another platform like Instagram or Twitter meet your needs? This is great information for someone like me – I am just about to create a blog. Thanks!